Complete your living room décor with these timeless occasional tables. Finished in a rich brown, these tables feature simple construction, angled table legs and a decorative slatted bottom shelf. Contemporary design with a hint of warm nostalgia results in a welcoming casual look for your home. 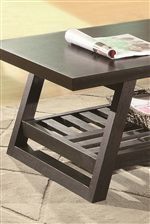 Essential items for those who love to entertain guests, this coffee table and end table allow you to serve snack and beverages with ease.